Superheroes and legos? Sure! 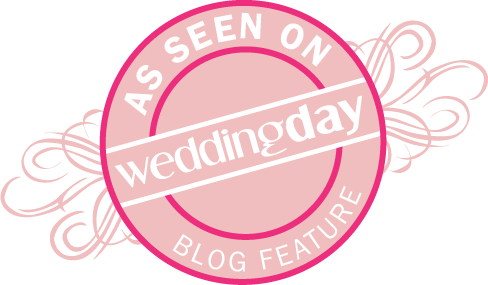 It is not your typical wedding design but I love doing things that are not typical. This was SO. FUN!!! It helped that Ryan and Christi were such a great couple to work with. We started with the bold colors used in comic books. 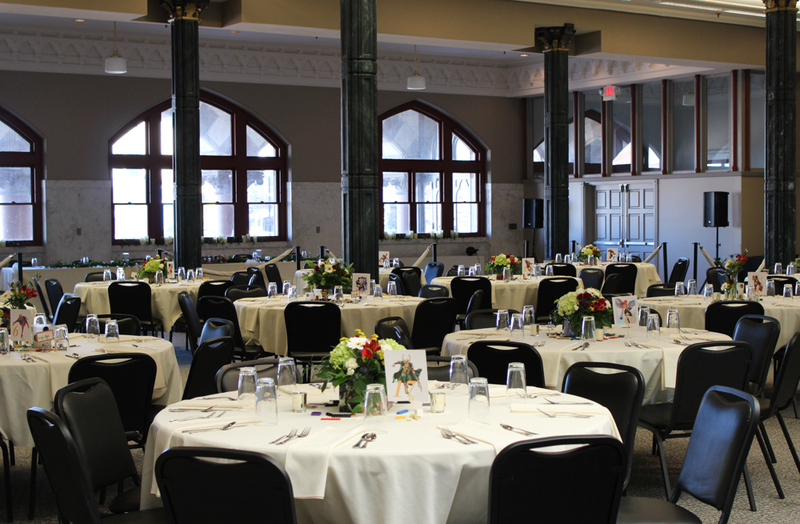 The reception was at the Old Post Office Place. We created three different designs for the guest tables. The bride created fun boxes covered in the groom’s comic books that we slipped glass cube vases into, filled with bright colors. 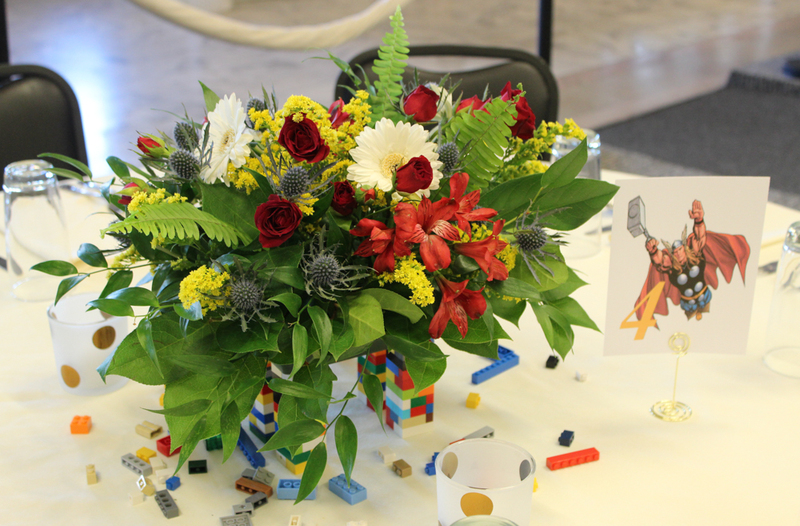 The second design used similar flowers but was slightly elevated on lego pedestals. 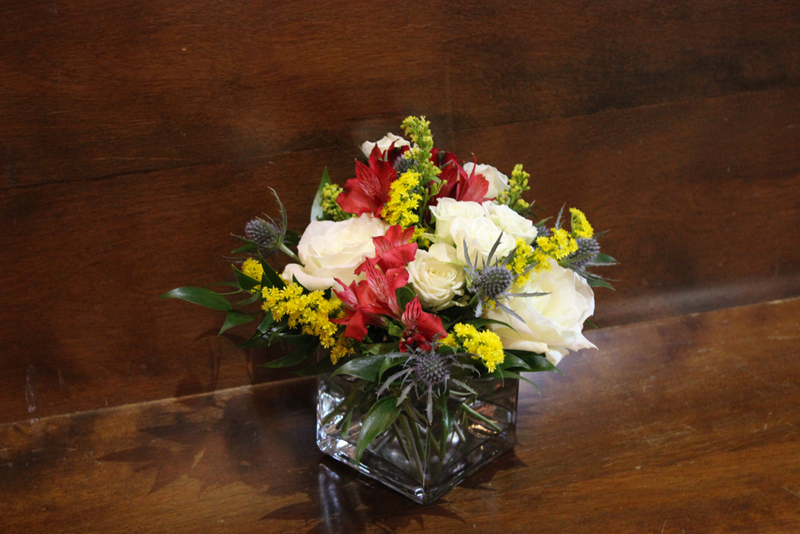 The final table design featured two coordinating bud vases. 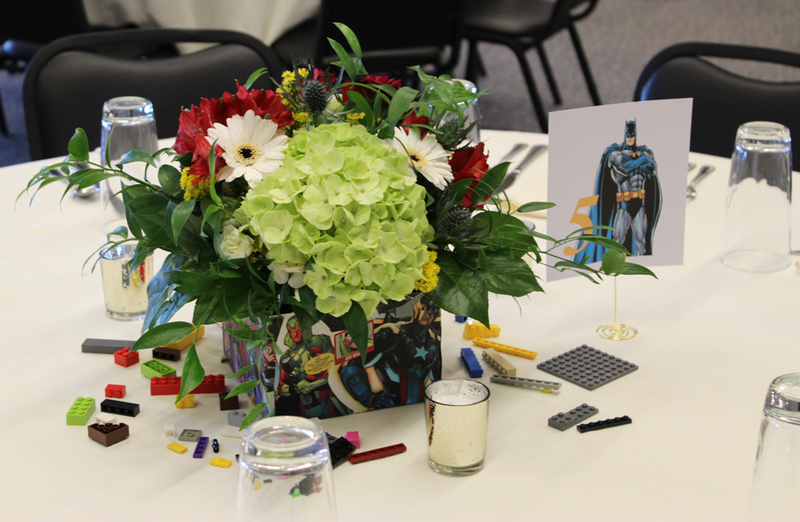 All three designs were tied together using superhero themed table numbers, candles and legos scattered on the table. 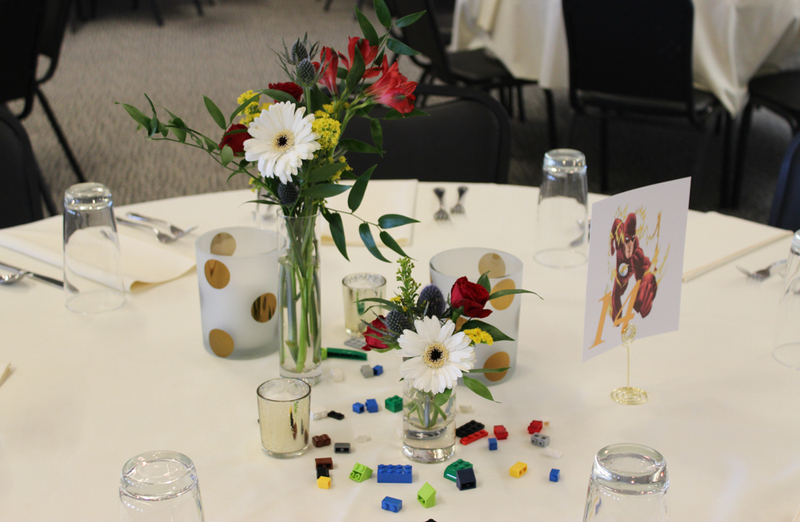 The loose legos were a fun, interactive item for guests. We found several creations that had been built when we went back to clean up that night! 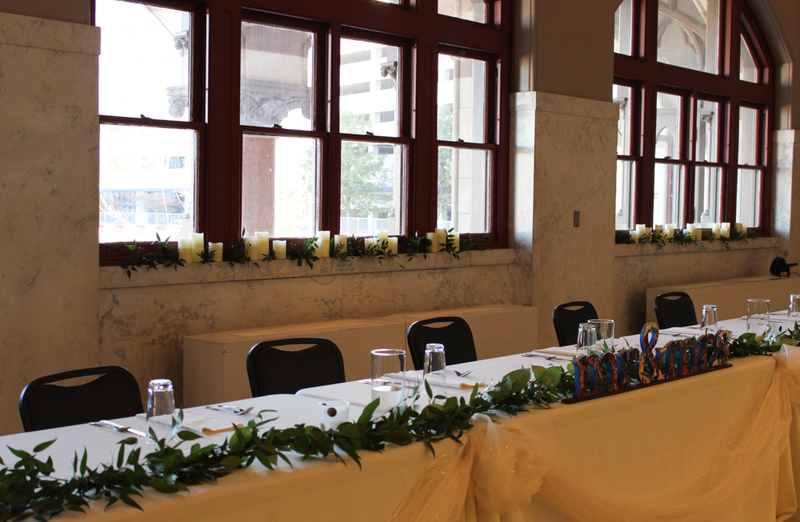 A simple garland, candles, and bouquet vases lined the head table. One of our favorite things to do at the Old Post Office Place is fill the windows with candles and greenery. It creates a warm, welcoming glow in the evening. The ceremony was at Neu Chapel on the University of Evansville campus. 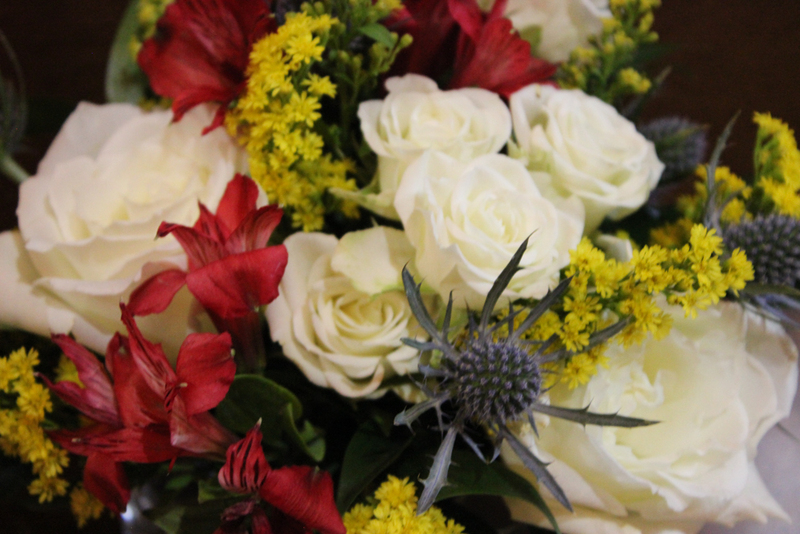 The ceremony flowers coordinated with the reception decor but we chose to substitute the white gerber daisies from the reception with white roses for a more formal ceremony look. Neu Chapel is beautiful, simple and does not need a lot of decoration. 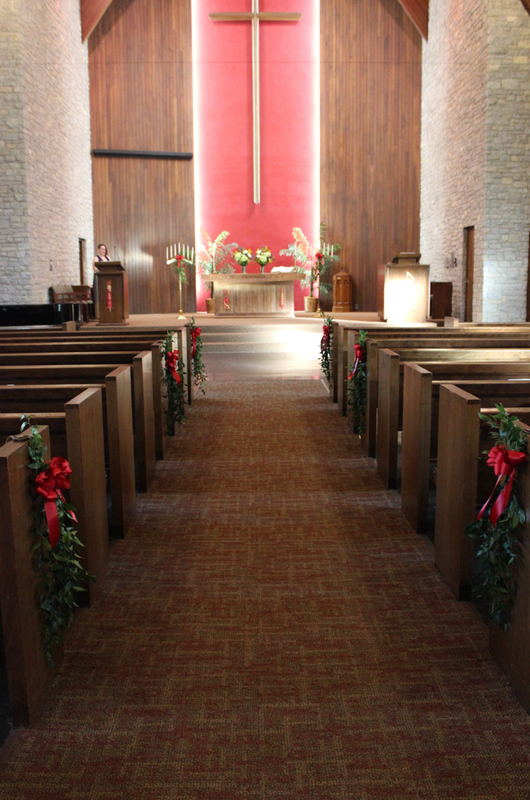 We placed swags of greenery with red bows on some of the pews to bring the colors from the wedding into the ceremony and it also blended well with the red wall behind the altar. 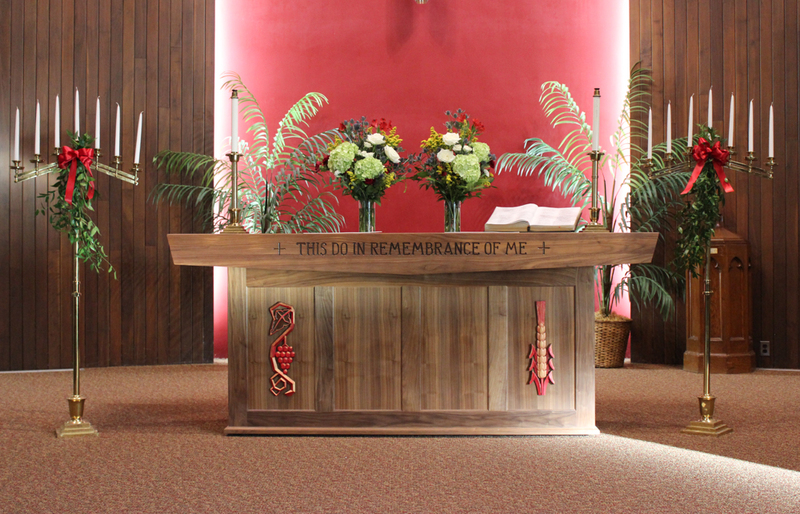 Swags were also placed on the candelabras and two altar arrangements would flank the unity candle that was later placed in the center. 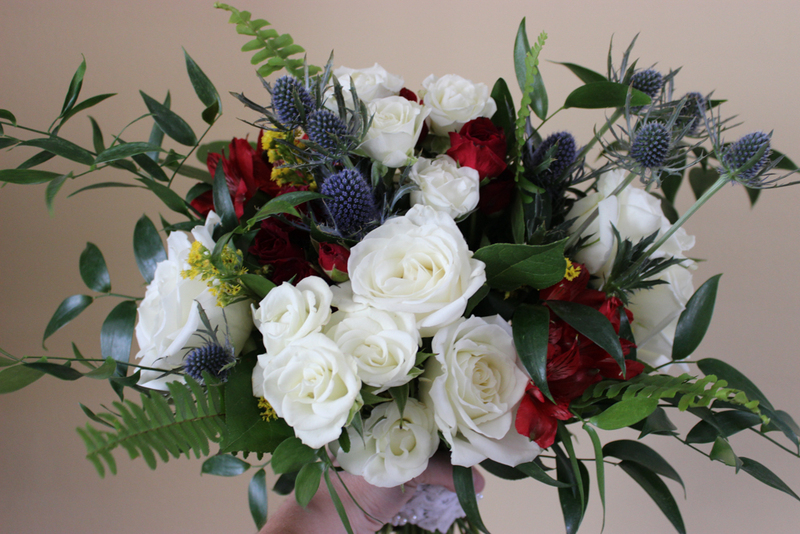 The bride carried a beautiful bouquet with a white focus that also had red accents to match the bridesmaid dresses. 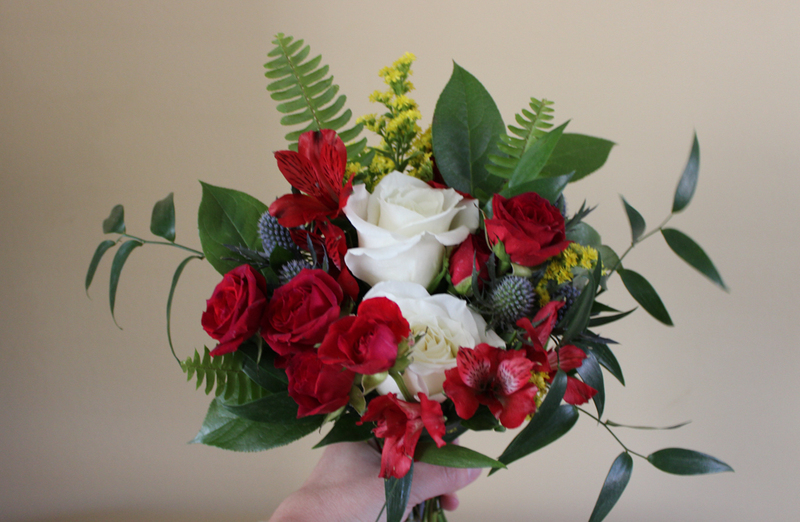 The bridesmaid bouquets had a red focus with a little white, blue, yellow, and greenery to contrast again their red dresses. 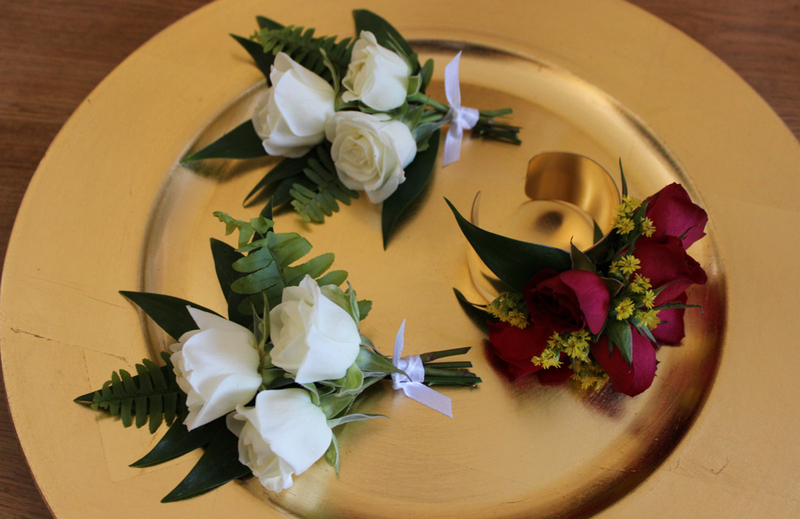 The grandmothers wore white pinned corsages while the mother of the groom wore a red wrist corsage. The most talked about pieces may be the boutonnieres. 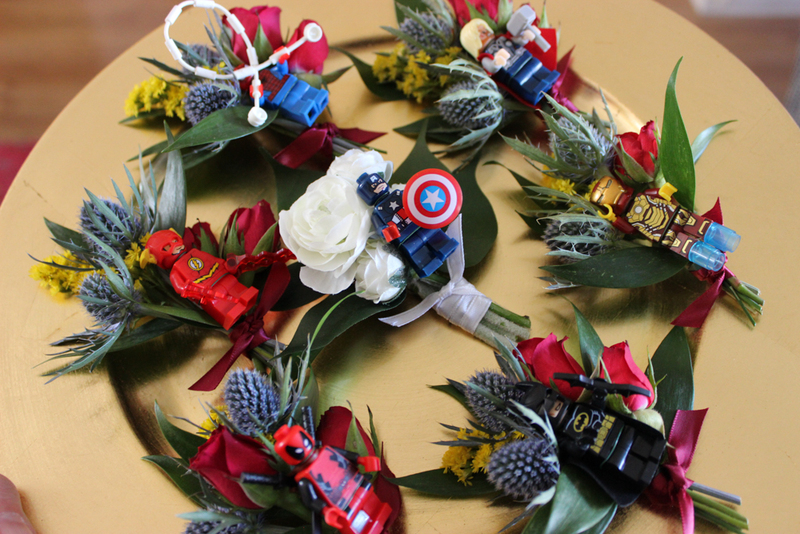 Lego superheroes were tied into the boutonnieres. Each was slightly different. The only request was that Captain America be saved for the groom. 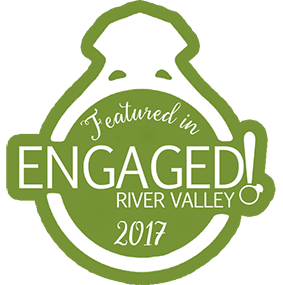 Thank you Christi and Ryan for trusting me to bring your vision to life and including me in all of the fun! Best wishes to you both!